As the day ends, unwind in pleasant company in the beautiful Wachau Valley. Admire the opulence of Palais Liechtenstein and sit enthralled during an enchanting private Viennese concert. 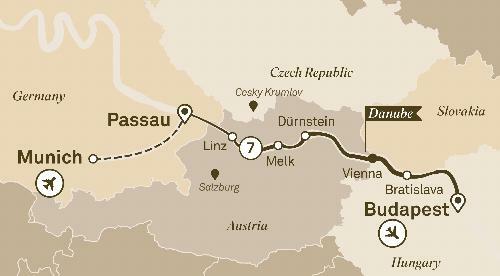 Explore the Iconic Danube on an 8 day luxury river cruise from Munich to Budapest. Take a guided hike in Passau & visit Salzburg, the birthplace of Mozart. Discover the delightful attractions along the banks of one of Europe's legendary waterways. Embark your Scenic Space-Ship in Passau and cruise to beautiful Budapest in all-inclusive luxury over eight days filled with wonder.